Lot Detail - 1775 Broaside - The Execution of Mary White. 1775 Broaside - The Execution of Mary White. 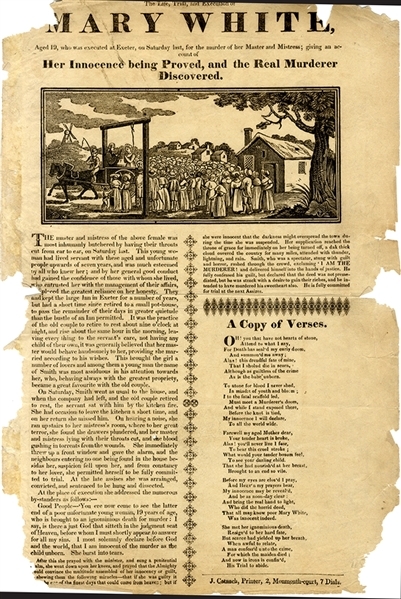 Broadside “ MARY WHITE, Aged 19, who was executed at Exeter...for the murder of her Master and Mistress” 10”x15”, with nice woodblock engraving of the hanging scene, where Mary White was hanged for having “most inhumanly butchered” her master and mistress who had “their throats cut from ear to ear.”, c1775, Exceter, . Some paper loss. Else very good condition.